Over the last few months, I have been working to complete a project for Cadence Apartments, a new luxury residential building located in the Eliot Neighborhood of NE Portland. 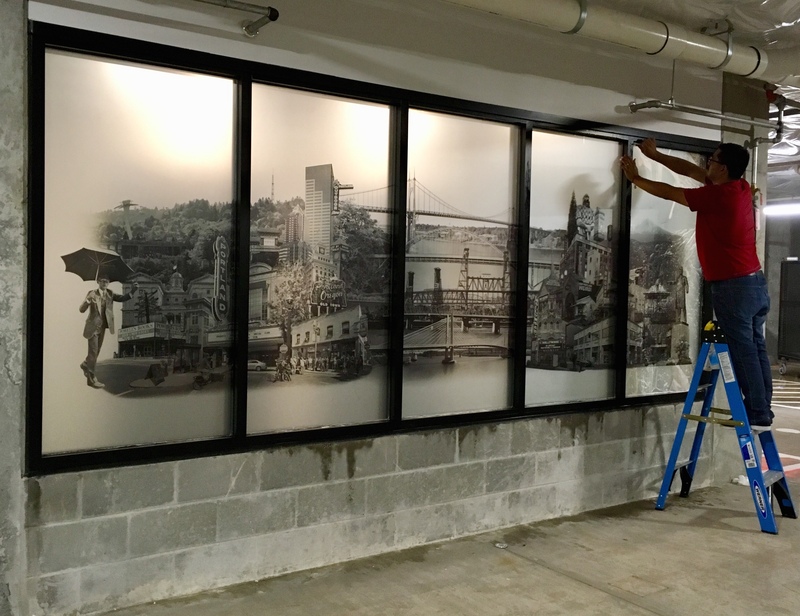 For this project, I teamed up with local muralist Caleb Jay Maltsberger to execute three large-format, highly detailed illustrations of my photographic work. 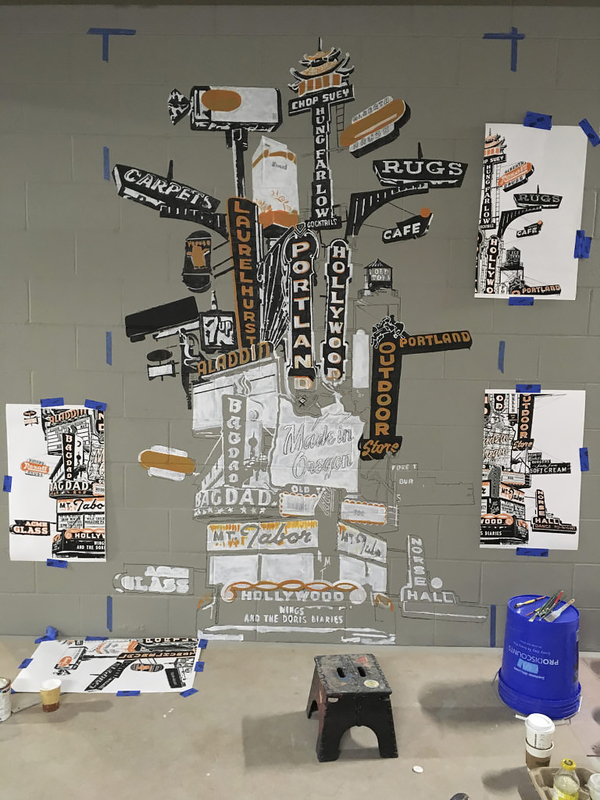 Caleb’s expertise and experience as a detailed artist made him a perfect match for this project. I was pretty busy just working on the project itself but, I took a few progress shots and videos to show the process. I can’t tell you how exciting it is to have my digital artwork hand-painted into 3 murals!! STEP 1: Many people have asked me how the image is transferred to the wall. For the indoor murals Caleb could use a projector, but for the outside mural, he used a technique called Pouncing. He created a hole-punched template off-site on to really large butcher paper. Then he brought the templates to the site and laid them out onto the wall and used charcoal to create a transfer into the wall. With the help of Devin Finley, here you can see the trace be revealed. I was sooooo excited to join in and paint! Over the last few years, I have been concentrating on my photography, so it was fun to use my painting and drawing skills again! The outside of the building has bright orange accent panels standing out from the building, giving the structure distinction. It was important to the client to keep the color scheme and it was requested that this orange was part of my artwork. I incorporated this color into all three of the pieces and we procured a custom-made color to use in the murals. STEP 4: Almost finished! Here is an up-close view of the outside mural from the scaffolding. The final step is to add an anti-graffiti coat on it. This was a large project! It included the outside mural, then two indoor murals and a vinyl art overlay on the elevator vestibule. 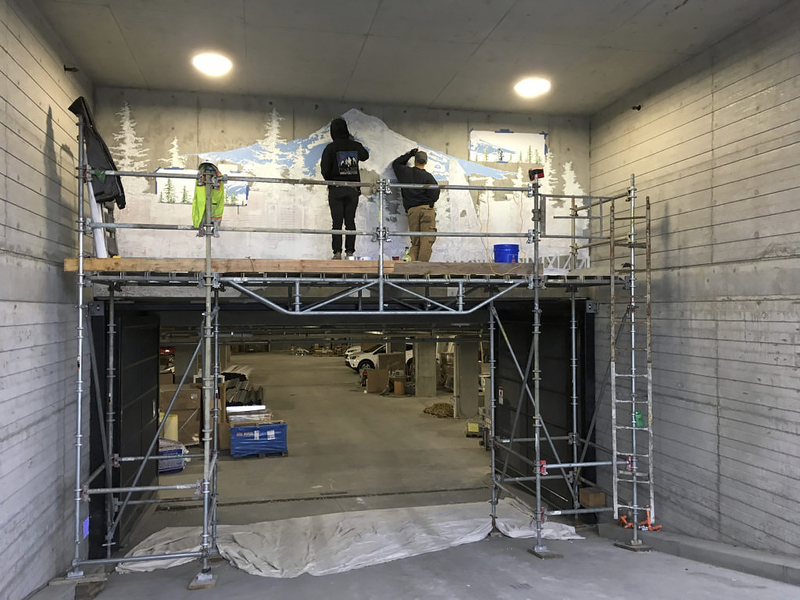 Here is a video explaining the indoor layout for the three art pieces being placed around the elevator vestibule in the parking garage. (This was filmed on Instagram Live, so enjoy my “Instagram Live Announcer Voice”). 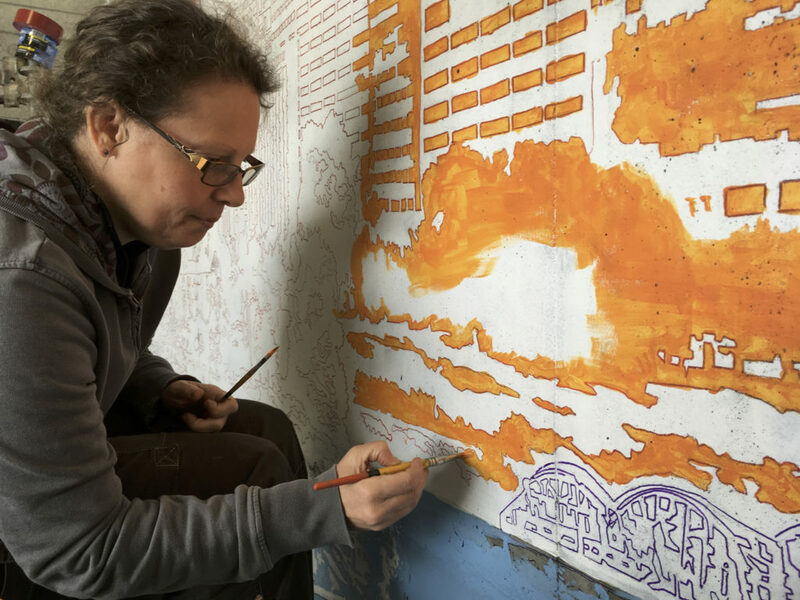 All three murals required an incredible amount of skill and attention to detail to execute; each of my photographic images were essentially being turned into large format paintings, which required several coats, careful tracing, and a steady hand. Caleb and I primarily used acrylic markers and small brushes, so the work was slow and steady. The indoor murals felt more like illustrations versus paintings! 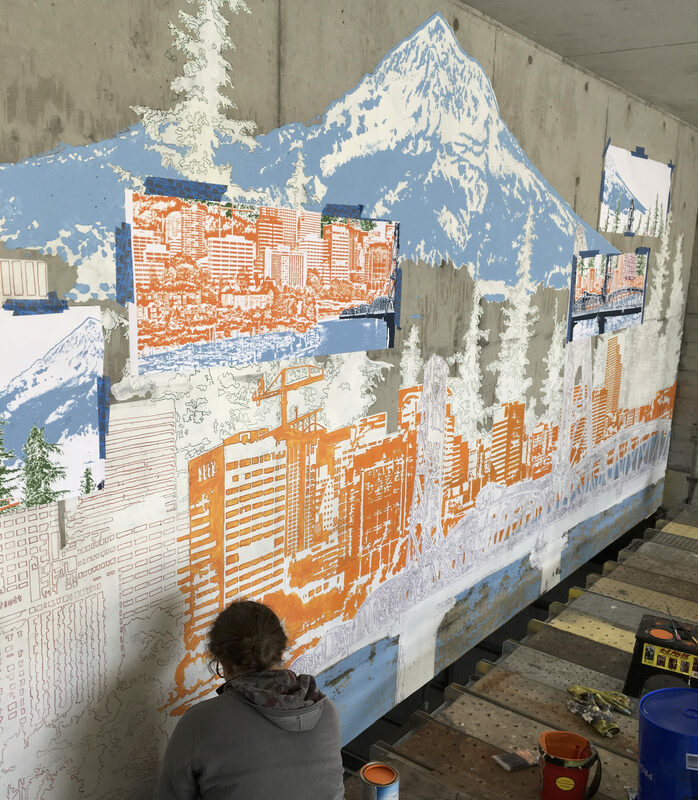 Here are some progress shots of the second and third murals done inside of the parking garage. 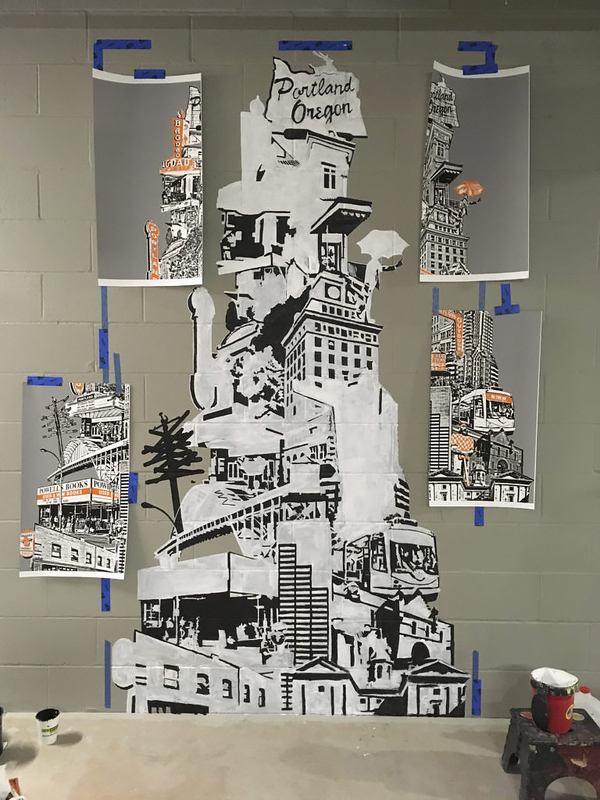 Here we are filling in the black areas that are in the “Portland Marquee Totem” piece. Both indoor murals could be transferred to the wall using a projector. 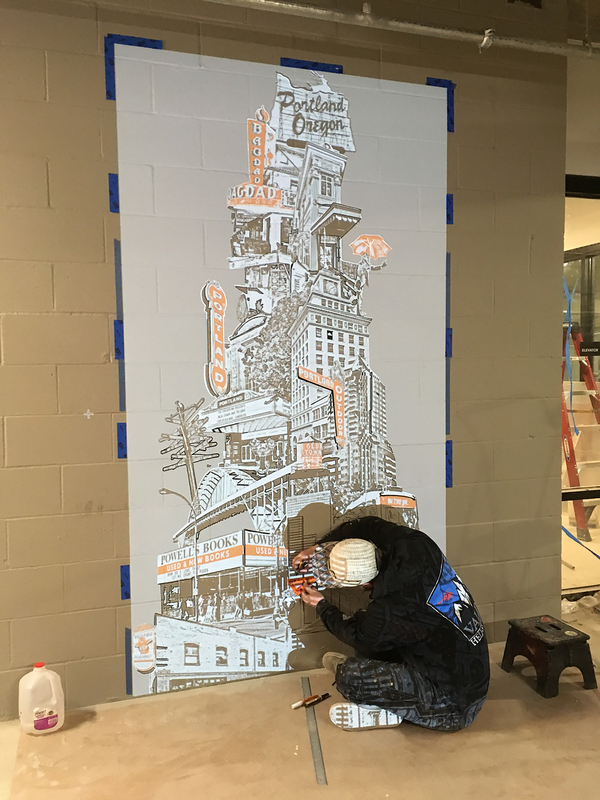 Here Caleb is doing a trace using projected image on the third mural. Here the main black areas and the white base is filled in. The next step was to add in the orange color. 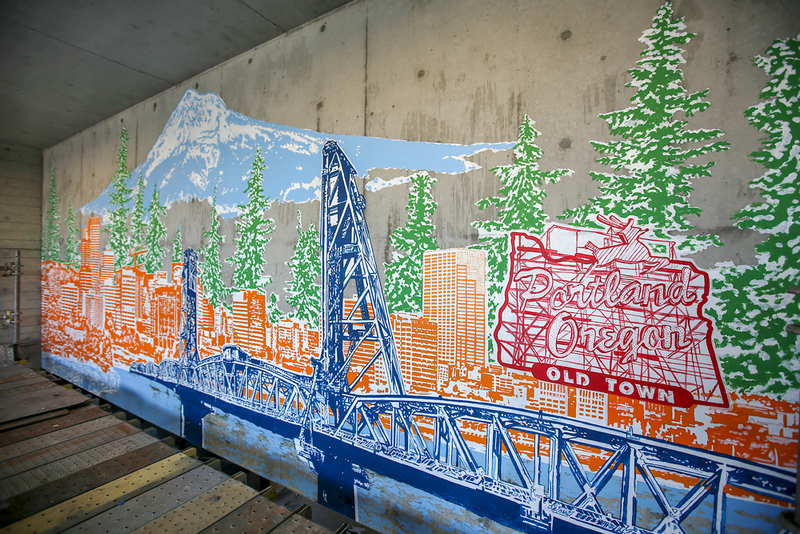 As mentioned in the video above, the fourth image, “Portland: East Meets West,” was transformed into a large vinyl overlay, expanding the length of the interior elevator vestibule. Five different vinyl overlays were created, then carefully applied to the exterior glass. The image can be seen from both inside and outside of the vestibule. The project is nearly complete, just a few finishing touches to add! Cadence Apartments are due to open later this Fall. Stay tuned for the final showing and time-lapse videos of the murals!